Living here in the typically sunny and dry state of Arizona, most of my neighbors have a distaste for rainy weather. A few souls still manage to head outside to enjoy the moisture, while the majority stay cooped up inside. I am one of the few that sprint for the door as soon as the rainy weather comes, because I love the unique conditions that can be photographed when the rain comes. This may be old news for the seasoned photographers out there, but for those of you that just shoot for fun, or are just getting into serious photography, learning to love the stormy weather may be something you never considered. Here are 5 BIG reasons why you should go out and take photos in the rain! If all you take are photos when the sun is shining and the sky is blue, your portfolio won’t have much variety. The same if all you shoot are sunsets. I love shooting sunsets but I don’t want that to be my one-trick pony! By heading out during a real storm, you won’t get the brilliant color of a blue sky or sunset, but a dark cloud filled sky will add its own dramatic atmosphere to the image! Some of my favorite images that I’ve ever taken feature brooding skies, and I often had to get wet in order to take them! At most locations, the absolute best time to shoot waterfalls or flowing creeks is when the light is dispersed and there is no direct (midday) sunlight on the scene. In order to find this lighting situation on a clear day, you usually have to visit early or late in the day. On a rainy day, the clouds block and disperse the sunlight, making it possible to shoot all day long! This is perfect for doing long exposures to create that silky effect on the moving water. Even if you just shoot with an iPhone or Android and are not able to do long exposures, your creek and waterfall photos absolutely will benefit from shooting in the dispersed light of a rainy day! The photo below even combines a brooding sky with a smooth waterfall. 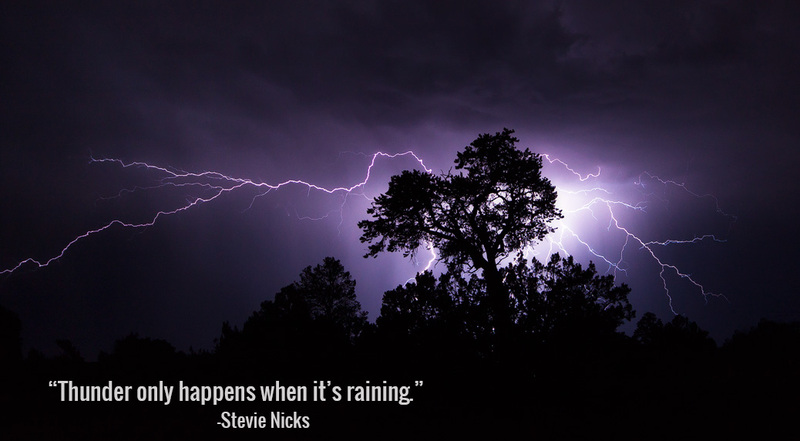 In the Fleetwood Mac song “Dreams”, Stevie Nix sings, “Thunder only happens when it’s raining…” To be clear, thunder only happens where there is lightning, but the lightning usually happens when it’s raining outside! Almost anytime I’ve shot lightning, I’ve had to get at least a little wet in the process. Once again, long exposures help immensely with capturing this phenomenon, but I’ve seen cool shots of lightning come out of iPhones if the photographer has a knack for timing and a little luck. Be sure not to put yourself in danger of being struck, but next time there’s a thunderstorm, instead of cuddling up with your “thunderbuddy”, take your buddy with you out to shoot lightning! By the way, I was huddled under an umbrella when I took the shot below. When it rains, that water falling from the sky has to go somewhere when it hits the ground, often pooling up in places that are normally dry. Where I live in Arizona, there are many famous places that have gorgeous reflecting pools in the desert landscape after a rain, but you can certainly find places in your own neighborhood that have their own seasonal pools. Reflections are a powerful visual effect that adds incredible interest to any photo, and if you can find them in a unique place where the water is only there for a short time, take advantage! You might just end up with one of the best photos you’ve ever taken. If not, it really is a lot of fun to shoot reflections…and fun should be the ultimate reason why you take photos! Like reflections, rainbows are powerful visual effect that almost always make for a good, if not spectacular photograph! It’s hard to predict when and where they will appear, so if you want to shoot one in a spectacular location, well you better get yourself out into the rain! Rainbows only happen when sunlight breaks through the clouds and passes through moisture in the air, so you usually have to wait out a storm before they will appear. Also, the sunlight has to be at a low angle, so rainbows typically happen early or late in the day. If you sit at home during a rainy day, your only rainbow shots will be taken with your neighbor’s house in the photo. But if you head out frequently during rainstorms and put yourself in cool locations, you will dramatically increase your chances of snagging an awesome rainbow pic. Because your typical rainbow happens in the afternoon when the clouds start to part, a rainbow is usually followed by a spectacular golden hour, and often the best sunset you’ve ever seen. Most sunset photos are taken during fair weather, with maybe some wispy clouds enhancing the light. However, if the sun finds an opening to shine through during a storm, get ready for a REAL sunset! Below is a shot I was able to take of a rainbow at sunset, while shooting at a very scenic location to boot! I could probably come up with an even longer list of reasons for shooting in the rain, but these are the 5 BIG reasons. Now consider this: a long-time saying is that the best photographers go out shooting when the weather is at its worst. If you are the type of person that stays home when the storms come in, change up your routine! You may be missing out on the best photos you’ve ever taken!